Lodge Picnic – THIS SATURDAY!!! This weekend, Owaneco Lodge is bringing back an old tradition, the Annual Spring Picnic at Hoyt Scout Reservation. This event is open to all members of the Order of the Arrow and for the first time, we are inviting all newly elected candidates to this awesome event! This Saturday from 9a-3p, we will be building Gaga pits at Hoyt. Lunch will be provided, followed by fun activities, games and an information session that is open to all candidates and parents at 2p. By the way, did I mention that this event is FREE for everyone? Are you interested in building the same Gaga pits as the ones you use at Camp Sequassen? Do you want to know more about Owaneco Lodge and the Order of the Arrow? Do you like free food? If so, register today at www.owaneco.org/register and email Lodge Chief Kenny Wright at chief@owaneco.org with questions! Looking for something fun to do this weekend? Look no further! Owaneco Lodge is hosting its annual Fall Fellowship! This year, we will be celebrating the 90th anniversary of Camp Sequassen with food, fun and fellowship! We will be having Sequassen-style competitions, lip-sync battles and more! Hurry up and register soon, because the event is this weekend (October 6-8) at Sequassen! Cost is $30. If interested, register at www.owaneco.org/register or contact Kenny at chief@owaneco.org. Celebrating the 90th anniversary of Camp Sequassen! -Plus, you get to wear your sash the entire day! Questions? Email Kenny Wright at chief@owaneco.org or see him at camp! The Past Two Ordeals and Conclave! What an amazing past two months this has been! May started off with Owaneco Lodge’s first event, the May Ordeal! Held in beautiful Camp Pomperaug in Union, CT, Owaneco Lodge inducted 71 new Ordeal members and 20 new Brotherhood members! Many members helped out with service project to benefit the camp, followed by an exciting night on Saturday with music, food, a conga line around camp, and Owaneco’s famous Cups game! Congratulations to Ryan and Ben for becoming Ordeal members! Congratulations to Ethan and Dylan for becoming Brotherhood members! Congratulations to Kenny for becoming a Vigil Honor member as well as the 2017-18 Owaneco Lodge Chief! 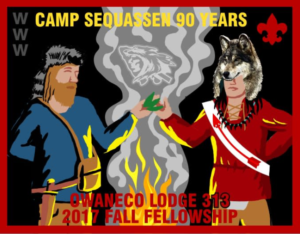 Represent Owaneco as the six lodges of Section NE-2A converge upon Moses Scout Reservation for a weekend of fun and fellowship. Conclave will be packed full of games, inter-lodge competitions, Scouting activities, service opportunities, and thoughtful training. Together, we set course on creating a greater program with our sights on better fulfilling the missions of the Order of the Arrow and the Boy Scouts of America in the modern world. Join your brothers from across the section for this fantastic event! June Ordeal – Elections, Sequassen and more! Our second Ordeal will be action-packed from the start on June 2nd to the end on June 4th at Camp Sequassen. There will be service to help set up for summer camp! Plus, you will also enjoy great food and fun activities during and after Saturday’s dinner. Remember, if you’ve been in the Order for at least 10 months, it’s time to become a Brotherhood member. Also, Lodge Officer elections will be held. So mark your calendar to attend to help select our 2017 – 2018 officers. We hope to see you there! Join the Owaneco Lodge May 12th to May 14th for an exciting weekend at the May Ordeal. Our first Ordeal in 2017 will be better than ever before! It’s time to kick off the year with a BANG with our theme- the Wild West! You can bet your lasso that there will be fantastic food, fellowship and awesome themed decorations. Hosted by the Scatacook Chapter, this Ordeal is going to be action packed and filled with adventure! So come on up to Camp Pomperaug in Union, CT for an unforgettable weekend! Register today! Have you been an Ordeal member for over ten months, come to the Ordeal to get your Brotherhood! Questions? Contact Kenny at wright@owaneco.0rg!